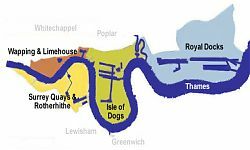 The group studies the history of the Port of London and surrounding area. This is achieved through weekly lectures during the winter and walks during the summer. The subjects for both are chosen by members of the group, who then undertake the necessary research in order to give a lecture or lead a walk. Sometimes there are themes to a term’s lectures, but this does not preclude subjects outside these themes. Past lectures have been very varied and have included the docks and their history, Thames Barges, East India Company, imports and dockland industries. There have been walks throughout the dockland area and the old Bata Factory and forts at Tilbury. Many members meet for a coffee before and after meetings. As everyone gives a talk each term, the Group is limited in size to about twelve but from time to time there are a limited number of places. New members are welcomed, particularly because they ensure the continuity of the group. The talks take place on Mondays during the day and are held at the Museum in Docklands on West India Dock. Details can be obtained from Ms Carr at the Museum Education Department., through the Museum of London’s web site.